Washington Square Park has all the ingredients to be a great public space, but a host of challenges stand in the way of its potential. A new concept for the park seeks to tackle those challenges head on and recreate the success other cities have seen with urban destination public spaces. With the iconic Union Station to the west, Crown Center to the South, all of the activity and energy of the Crossroads to the north, and one of Kansas City’s densest concentrations of employment to the east, Washington Square Park has the setting to become a great public space and a premier destination attraction for Downtown Kansas City. But despite its many advantages, and despite the collection of “fests” it hosts each year, there is no question that Washington Square Park falls far short of its potential. The obstacles to the park’s success are clear. 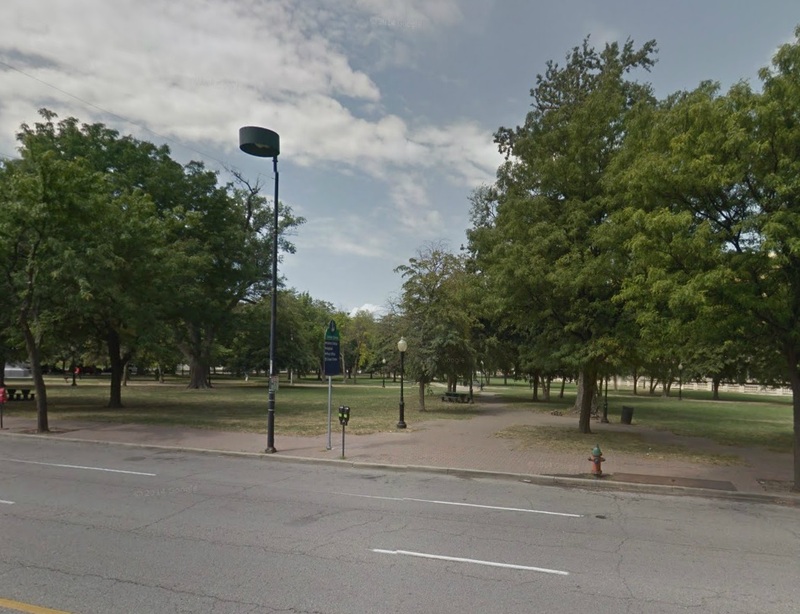 While the location of the park within Downtown is ideal, it suffers from a lack of active surroundings. To the north, a tall wall, parking lot, and railroads separate the park from the Crossroads. Railroads, viaducts, parking Lots, and giant walls present very real barriers between Washington Square Park and residents who might use it. 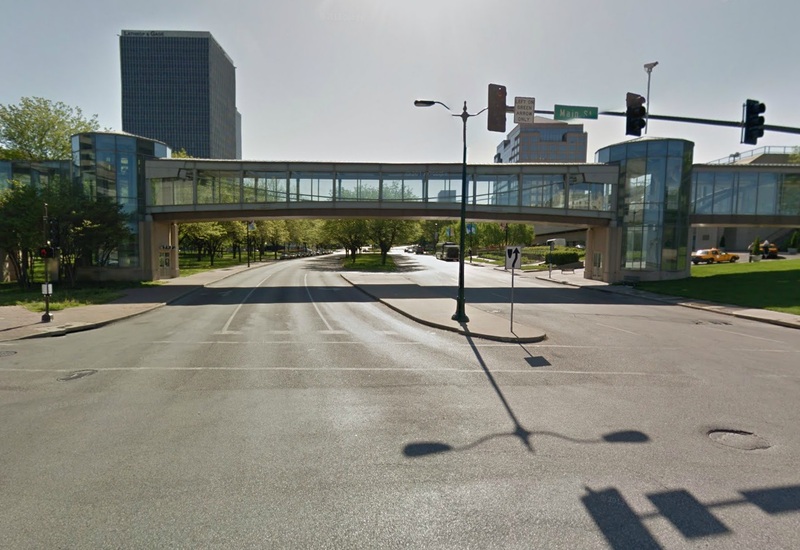 Crown Center is located across the street to the south, but the inward focus of the shopping center and the inhospitable face toward Pershing steal away any potential for activity. Crown Center is a tourist, retail, and employment destination – a great recipe for a successful park. But its front door facing Washington Square Park is not a place for people. Main Street is at its widest, with traffic at the highest speed, between the park and Union Station, and the connective role that the park could play between Union Station and Crown Center is eclipsed by the Link, which encourages visitors to stay away from the park and carries an implicit message that the park is an undesirable place to be. 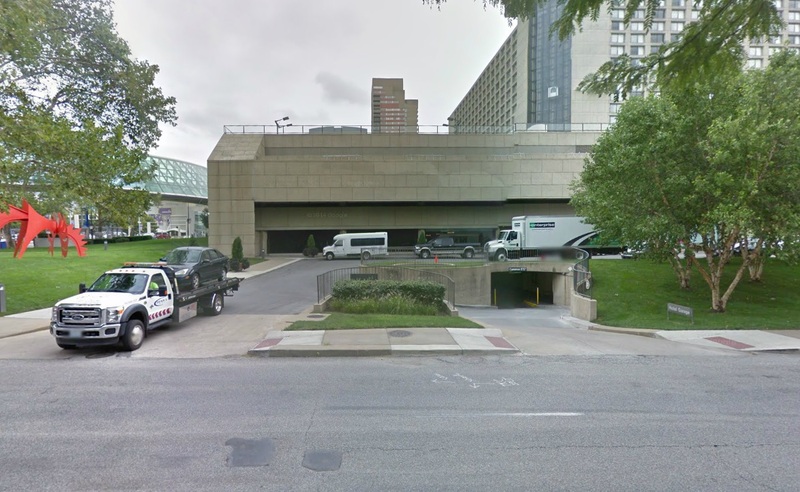 The interface with Pershing is an afterthought for the Park and for Crown Center. Best to float above it in a shiny tube. 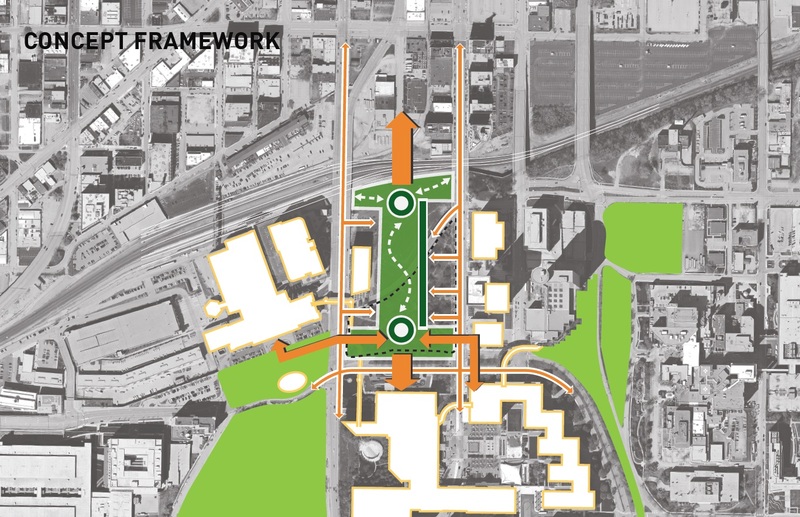 The Link further isolates the park by severing the view and physical relationship between the Park and Union Station. Visitors enjoy this view of iconic Union Station from Washington Square Park. While many people work in the office buildings to the east, the ground floor design, mix of uses, and hours of activity limit interaction with the park. To that end, Washington Square Park does little to embrace its surroundings either. It is uniquely flanked by Main Street, Grand Boulevard, and Pershing Road, which are all signature streets in their own right, but the current design of the roads and the park ignores these critical relationships. Washington Square is uniquely flanked by Main Street, Grand Boulevard, and Pershing Road, but the current design of the roads and the Park ignores these critical relationships. The design of the park itself is haphazard, and discourages active use. The park is occasional used for Crown Center festivals, where it hosts food trucks, portable restrooms, and temporary stages, but outside of these few days, the space lacks active programming of its own. The trees, paths, and seating are pleasant, but they do not promote or accommodate regular activity. Those who might make use of the attractive open space – residents from the crossroads, hotel guests, office workers, or shoppers at Crown Center, ultimately find the park too hard to get to, and the rewards too few to bother. The result is a park that is mostly empty most of the time. On second thought, let’s not walk to the park. 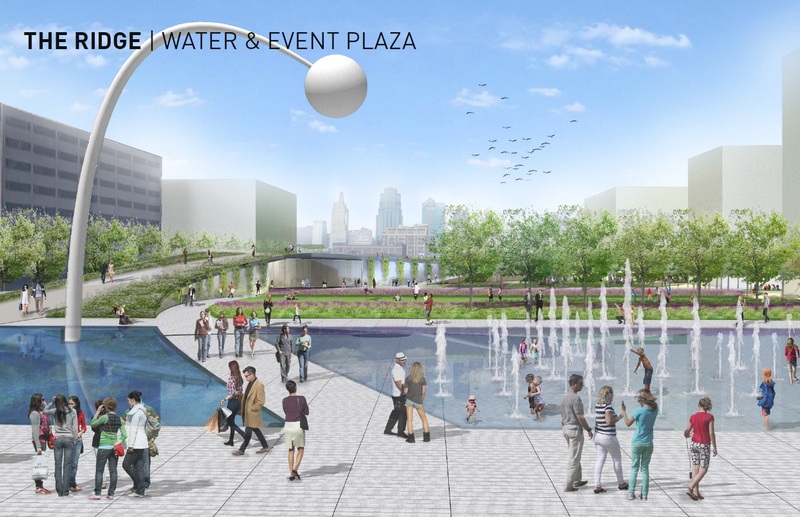 In 2012, the Kansas City Design Center worked with the Downtown Council Green Space Committee and the City’s Parks and Recreation Department to develop a vision and framework for Downtown green space. As part of that process, Washington Square Park emerged as an opportunity for an iconic, multi-purpose destination space, in coordination with an effort to enhance connections between the park, the Crossroads, and Crown Center. In 2013, with support from Downtown stakeholders and the Greater Downtown Area Plan Implementation Committee, this process evolved into a PIAC funded project to enhance the park. The Parks and Recreation Department, in coordination with the Kansas City Design Center and Coen + Partners, has been working with stakeholders to develop a concept that can address the challenges facing the park and successfully transform it into an iconic destination. After long months of analysis, design, and engagement, the Parks and Recreation Department and Coen + Partners presented at the end October two concepts for a new Washington Square Park. These concepts both bring a creative, thoughtful approach to overcoming the park’s challenges and positioning it to become something special. The concepts for Washington Square Park seek to reconnect the park to its surroundings, improve its edges, and encourage activity. The new concepts are both made possible through the idea of a land swap with the parking lot to the north of the park. This idea begins with the recognition that one of the features that gives Washington Square Park a “wow” factor is the stunning view of the Downtown skyline. 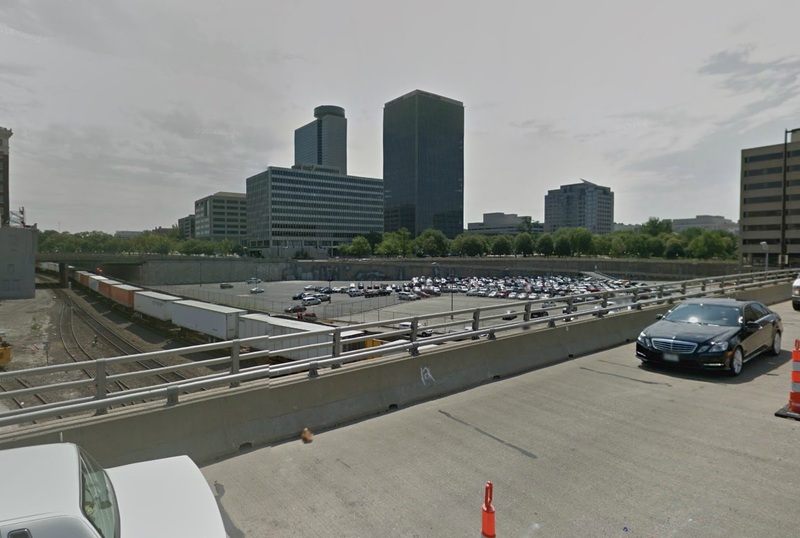 Future development of the surface parking to the north would block the view, and is awkward anyway due to the shape and constraints of the parking lot parcel. 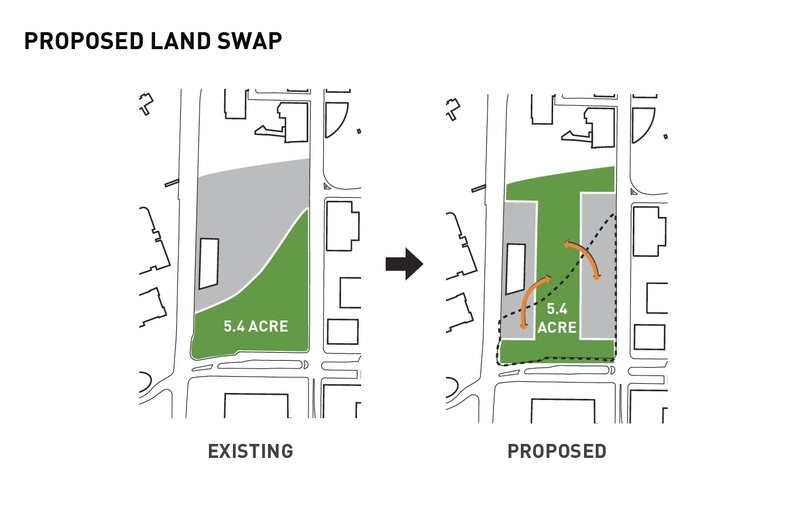 A land swap repositions development to flank the park and front the street, which would take a major step toward addressing one of the park’s fundamental challenges – its current lack of active surroundings. While the total area of the park and developable land would remain the same, the swap would allow new development to front Main Street and Grand Boulevard, as well as the park itself, putting thousands of potential new users at the park’s front door, providing an invaluable amenity for new development, and placing “eyes on the park” throughout the day. The change in the shape of the park allows it to directly connect to the Crossroads, preserves and enhances its stunning views, and creates a configuration that aligns closely with some of the most successful urban parks around the country. The proposed land swap is a brilliant way to make the park work better, make future development work better, and position the park and new development to support each other. After seeing the potential of this reconfigured park space, it is hard to imagine Washington Square Park being successful without it. The good news is that all of the necessary stakeholders and development partners are fully supportive of the concept. Union Station, which owns the parking lot to the north of the park, and their development partner Van Trust Real Estate LLC, have been supportive of the idea, and active partners in exploring how a reconfigured park and new development could both be more successful. The land swap and new development opportunities really set the stage for the other recommendations to enhance the park. The City is exploring two distinct concepts for the park, but both concepts share important functional similarities. 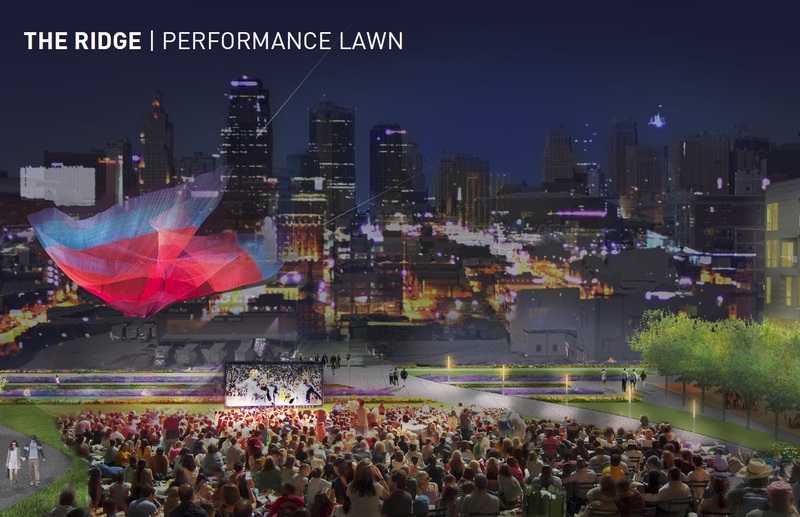 The first concept, called “The Ridge,” evokes the region’s rolling prairies (a loose association at best) to propose a gradually sloping ridge overlook that terminates in a performance lawn with the stunning Kansas City skyline as backdrop. 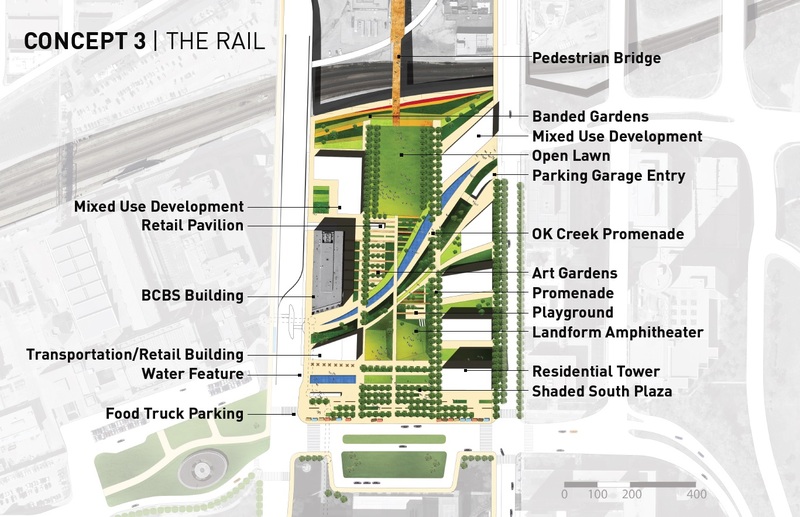 The second concept, “The Rail,” makes a gesture toward the long buried OK Creek beneath the park to create a new interactive promenade, connecting Main and Grand. 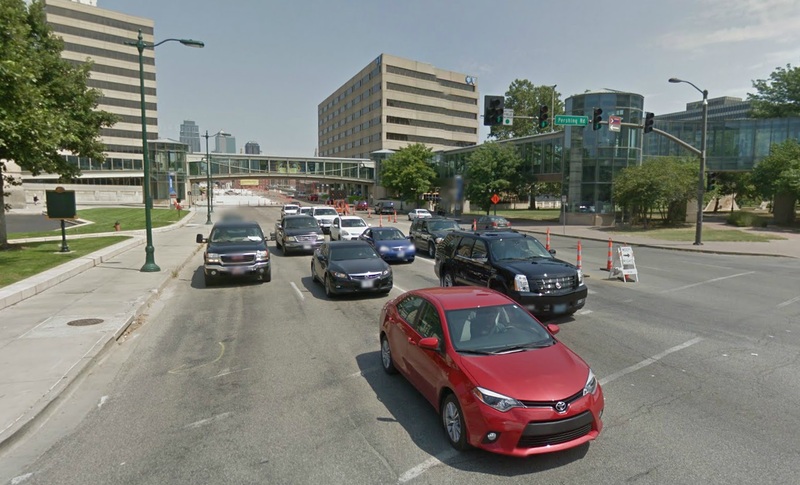 By extending the park north, both concepts create the possibility for a new pedestrian bridge across the railroad tracks that can strengthen the connection with the Crossroads. 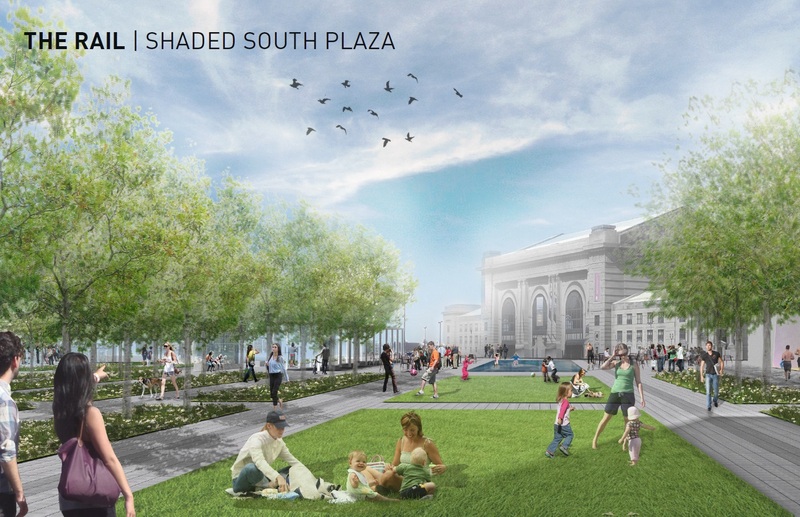 The new designs recognize that unique position of Washington Square Park at the southern end of Downtown streetcar starter line and envision a transportation facility that could incorporate transit amenities, bicycle facilities, and perhaps other retail and services.Both concepts also preserve and enhance the dramatic view of the Kansas City skyline, which becomes more directly integrated into the staging and programming for the park. 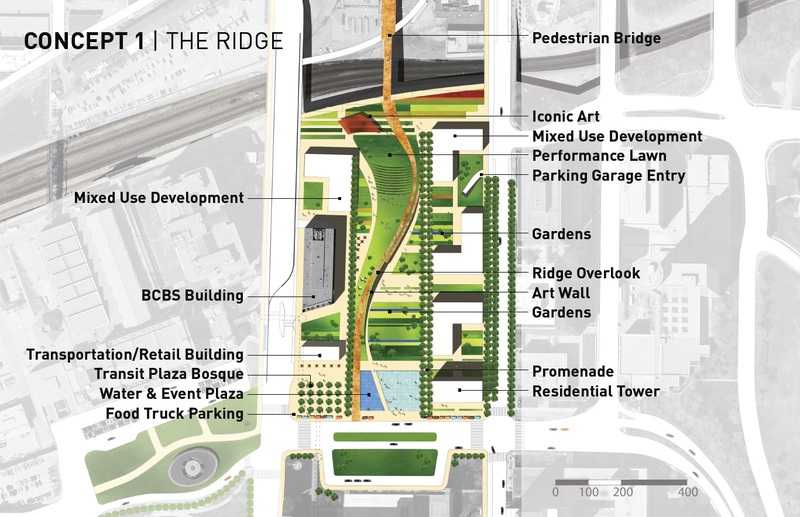 “The Ridge” Concept includes a sloping performance lawn with the dramatic skyline of Kansas City as the backdrop. The proposed concepts are very deliberate about enhancing and activating the street edges. The new development concepts help to do that in part, but the park design intentionally makes Pershing the front door to the park, and focuses activities and amenities around the park edges. Circulation through the park is more carefully considered than the current pathways, and facilitates the connective role that the park should be playing. 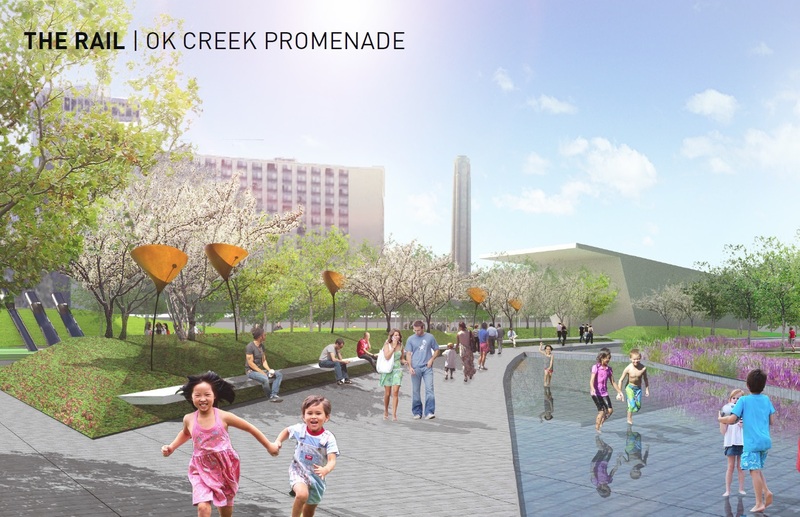 “The Rail” concept includes a promenade with water feature that evokes the historic OK Creek. The promenade also connects Grand Boulevard to the streetcar terminus on Main Street. The design team is focusing on elements within the park that will activate the space. This includes potential retail, food, and amenities, as well as interactive design features, such as fountains, art, gardens, and more. Both concepts are deliberate about embracing the edges of the park and integrating design features and programming that encourage activity. The proposed concepts also recognize the importance of Union Station as a neighbor to the park, and the disruptive barrier that the Link skywalk creates. This design exploration has spurred a fascinating (for some) tale of good intentions, unintended consequences, and federal funding related to the Link. (Credit to @kclightrail for his Twitter detective work through the Kansas City Star archives). The Link was constructed in 2000 with the goal of enhancing retail at Union Station. The Parks Board at the time opposed the Link as “A barrier both visually & psychologically”, and “a foreign object in the park system.” In response, Mayor Barnes replaced the Parks board in 1999 with people who would approve the project. The Link cost a total of $13 million, and was paid for in part with federal funding through the Federal Transit Administration. The justification for federal funding was that it would enhance bus ridership on Grand by connecting to Union Station. Something tall, expensive, and ill-conceived is missing from this picture. Today, a broader consensus on the visual and psychological barrier that the Link creates is compounded by knowledge of the cost it takes to heat, cool, and maintain. The proposed concepts envision the Link going away, and illustrate an unobstructed view between Washington Square Park and Union Station. The catch? Removing the link now may require the repayment of those millions of dollars of federal funding. The City and design team have expressed optimism that the federal funding issues can be resolved, but the issue has placed an interesting twist on a facility that no one wants but no one can afford to remove. 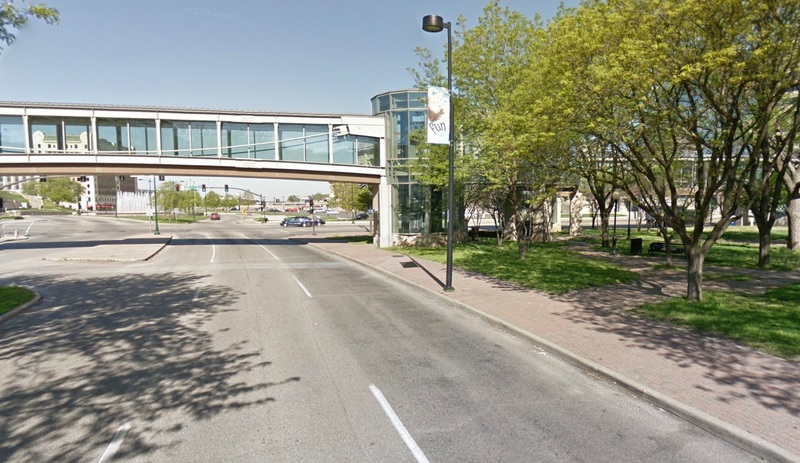 At the recent public meeting, the notion of opening up the skywalk and creating a “High Line” type of experience was even discussed. Perhaps the most encouraging aspect of the new concepts for Washington Square Park is that they don’t exist as ideas in a vacuum. The entire design process has included close consultation and partnership with surrounding stakeholders, property owners, and development partners. The potential to enhance the development opportunities on the site creates a powerful motivation for private developers work toward and contribute to a more successful public space. The design process for Washington Square Park also includes a financing component. As one participant stated at the October public meeting. “This all sounds great. But what about the money?” The design team includes HR&A Advisors, who are among the very best at what they do, which includes developing creative and realistic financing models for open space, and crafting sustainable maintenance and operations programs. Many of the signature urban parks around the Country employ a melding of public and private financing streams. There is a very real opportunity to combine the strong design ideas being explored for Washington Square Park with real financing strategies that are viable and beneficial for all parties. While the project is still in its early phases and nothing is certain, the proposals for Washington Square Park take the right steps to create a beautiful, iconic civic space, and have a clear and compelling path to completion. Urban Angle will be following closely as proposals for the parks are finalized, with confidence that the vision for Washington Square Park can become reality. You can check out the complete presentation at October’s Public Meeting below. All concept images are courtesy of the Kansas City Parks and Recreation Department and Coen + Partners.